We have grown to really, really like hummus. In fact at times, you could say I crave it. 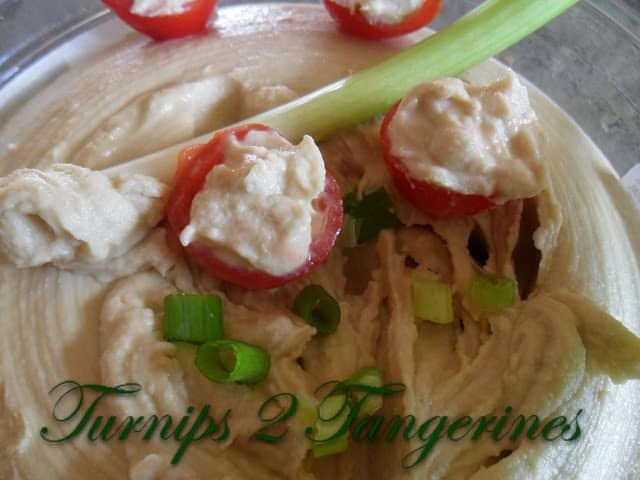 My hubby is a so so hummus fan but everyone else in the clan loves it as much as I do. 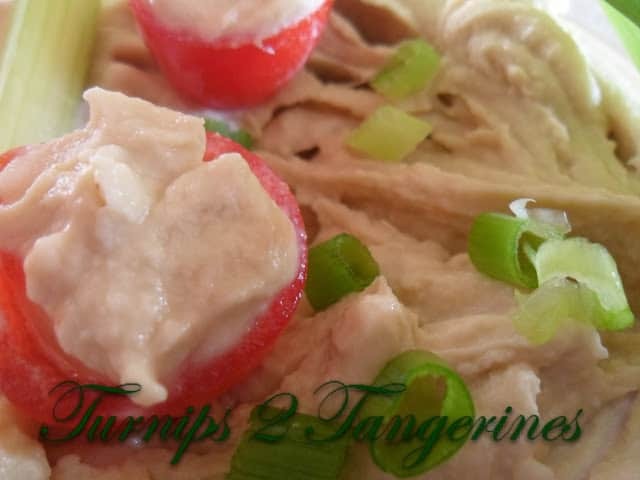 Hummus is served in cherry tomato shells along with assorted vegetable dippers such as green onions. There are many wonderful brands of hummus on the market today, Sabros being one we really like but once in awhile I like to “get fancy” and make hummus from scratch. Hummus [HOOM-uhs] This thick Middle Eastern sauce is made from mashed chickpeas seasoned with lemon juice, garlic and olive or sesame oil. It’s usually served as a dip with pieces of pita bread or as a sauce. When combined with tahini, a sesame-seed paste, it becomes hummus bi tahina. Middle Eastern markets carry both forms in cans or jars and sometimes fresh. In my house anyway, we serve and enjoy hummus as a dip served with pita bread, pita chips and with vegetables. 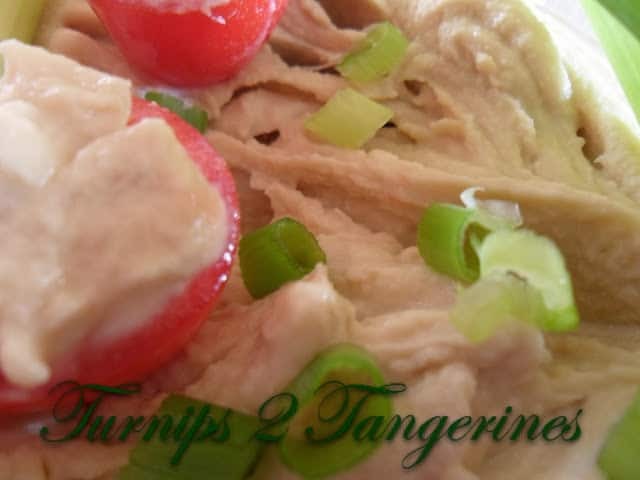 In a blender container or food processor bowl, combine tahini and lemon juice. Cover and blend for 2 minutes. Add chickpeas, oil, and garlic cloves. Cover and blend for 2 minutes. Add dill, curry powder, salt, and ground red pepper. Cover and blend until mixture is smooth, stopping and scraping sides as necessary. Cover and chill for up to 3 days. Stir hummus before serving. 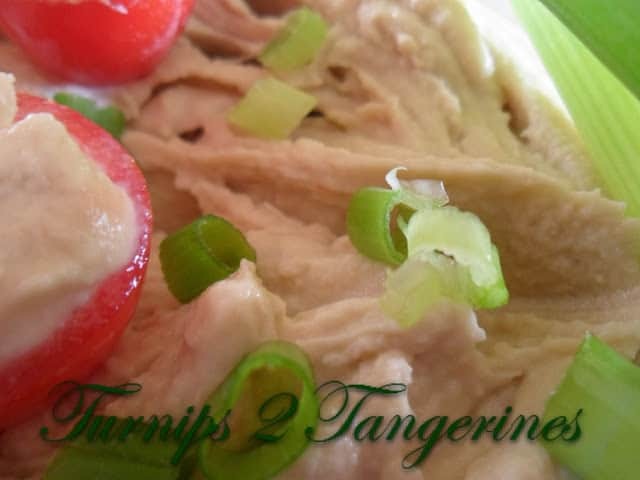 Fill cherry tomatoes with hummus and/or serve with assorted veggie dipper. For a creamier hummus, remove the skin/shells from the rinsed and drained chickpeas. Great healthier game day recipe, Lynn. Don't get me wrong, I love all the cheesy dips. But I have very little control around them! Thank you for linking this week. Thanks for sharing this with the Blog Hop Blitz!!! I always look forward to seeing all your great recipes!